The WBF President Gianarrigo Rona, the BFAME President Emeritus & WBF Vice-President Mazhar Jafri and the WBF Secretary Simon Fellus, together the Jordan Bridge Federation President, Mr. Ghassam Ghanem and the Chairman of the Organizing Committee, Mr. Bahjat Majali attended the Opening Ceremony of the Championship on Wednesday 27th May. The Ceremony was celebrated in a very friendly and entertaining atmosphere. 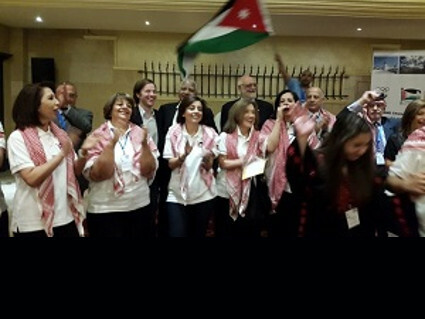 The Championship, under the high patronage of H. R. H. Prince Faisal Ben Al Hussein, President of the Jordanian Olympic Committee, was declared officially open by Mrs. Lubna Al Salem, Secretary General of the Jordanian Olympic Committee. 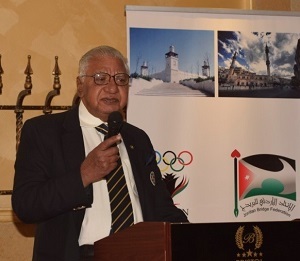 In his address Mr. Rona welcomed the players, representing 9 of the 11 BFAME affiliated Countries, expressed his gratitude to H. R. H. Prince Faisal Ben Al Hussein for his high patronage and congratulated the Jordanian Bridge Federation and the Local Organizing Committee. 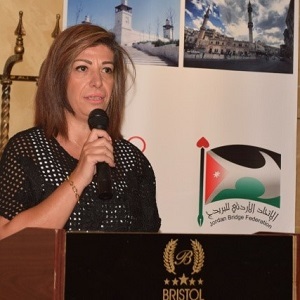 In the evening of Tuesday, President Rona with Mr. Jafri and Mr. Fellus, accompanied by Mr. Majali, visited the Jordanian Bridge Association Club, which counts more than 300 registered members, and met its officers and several players during their club tournament. 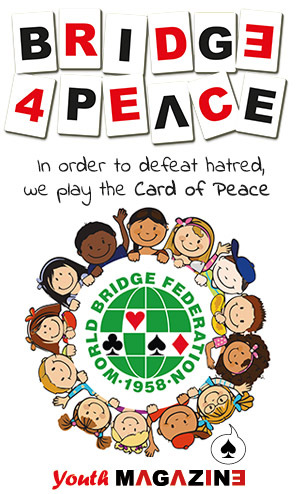 Mr. Rona brought to them the greetings and wishes from the WBF and congratulated the Club for its impressive organisation, the services offered and the technological devices adopted to run the bridge activity. On Friday 28th the WBF President and Secretary attended the BFAME General Meeting, chaired by Mr. Mazhar Jafri, BFAME President Emeritus and attended by the representatives of Bahrain, Bangladesh, India, Jordan, Pakistan, Palestine, Qatar, Sri Lanka and Emirates. Mr. Rona addressed the meeting, welcoming the President of the Emirates Bridge Federation, a newly affiliated member of both the WBF and BFAME and congratulating Mr. Bahjat Majali and Mr. Ghassam Ghanem for the excellent organisation of the Championship. He reported on the activity of the WBF in the past quadriennium and the plans for the future and remarked the importance of the organisation, for the first time in the history of the Zone, of the World Teams Championship in Chennai next September. In the second session of the General Meeting, chaired by the President Emeritus Mazhar Jafri, on Saturday 29th, Mr. Ashok Goel from India, was elected BFAME President. Mr. Bahjat Majali, from Jordan, Mr. Kirubakara Moorthy, from India and Mr. Ahmed Al Midfa from UAE were elected as Vice Presidents. Mr. Azwerul Haq, from Pakistan was also elected as Vice-President and Secretary while Mr. Senaweera, from Sri Lanka was elected as Treasurer. Mr. Mazhar Jafri was re-elected by acclamation Member of the WBF Executive Council, representing the Bridge Federation of Asia and Middle East so maintaining his position of WBF Vice President.